This is a no-frills, easy, traditional apple crisp recipe that can’t be beat. 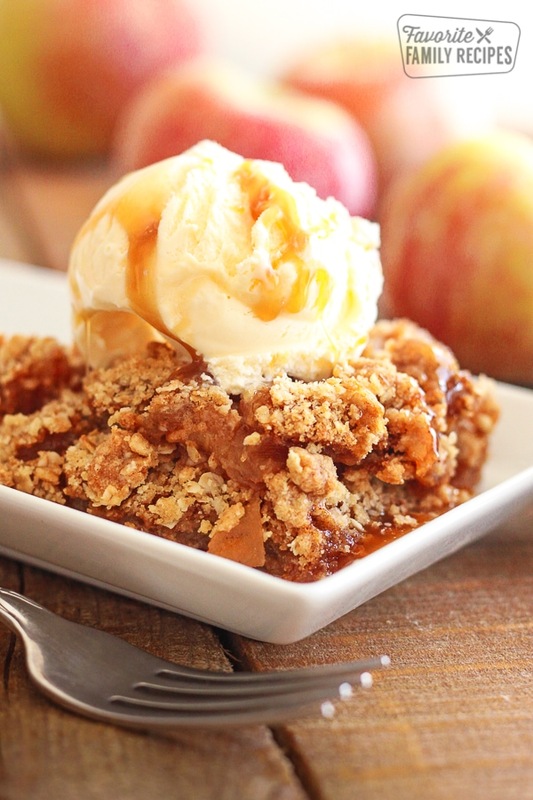 The apples are cooked to perfection and topped with a sweet crumb topping. One thing I love about the Pacific Northwest in the Fall (among many, many other things) is the APPLES. I can’t seem to get enough of them! I love picking them straight from the orchard and bringing them home and whipping up a recipe like this apple crisp. Which apples are best for an Apple Crisp recipe? If you aren’t familiar with baking with apples you should know that some apples are better for baking than others. In baking recipes you want to use tart or semi-tart apples such as Granny Smith, Pink Lady, Honey Crisp, Fuji, Gala, Jonagold. The apples should be tart and crisp. You don’t want them turning to mush while baking. For this particular recipe, I usually opt for Granny Smith apples. Granny Smith apples are pretty tart and they balance out the sweetness of the crumb topping nicely. When serving this traditional apple crisp, I always add a big ol’ scoop or vanilla ice cream and then drizzle with a little caramel topping for good measure. If you aren’t a fan of apples or you don’t have any on hand, you can always use peaches or pears instead. We actually have a great Peach Crisp recipe (that can be made in a slow cooker) HERE. If you have an abundance of apples this year or are just looking to try some new apple recipes, we have lots of favorites to share with you! Try our Dutch Apple Pie that bakes in a brown paper bag, our Disneyland Apple Pie Caramel Apples, or Apple Fries with Caramel Cream Dip. If you want to try something a little more savory, try our Copycat Bluebird Turkey and Brie Sandwich or our tasty Apple, Ham, and Cheddar Melts. If you want to see ALL of our apple recipes, click HERE. This traditional apple crisp recipe combines perfectly cooked tart apples with a sweet crumble topping. It is delicious served with vanilla ice cream or whipped cream. Combine sliced apples, sugar, flour, cinnamon, nutmeg, and almond extract in a large bowl. Toss until apples are evenly covered. Place apples in a 9x13 pan and sprinkle evenly with 2 Tbsp. water. In a separate bowl (you can actually use the same bowl you did the apples in to avoid extra dishes), combine topping ingredients, minus the butter. When topping ingredients are well mixed, add the butter using a pastry blender or wooden spoon. Mix until it becomes nice and crumbly then sprinkle over the apples. Place in the oven at 350-degrees for 40-45 minutes. Serve with vanilla ice cream or whipped cream and caramel topping. I also made this with peaches. I tossed 2-16 oz bags of frozen peaches in 1 cup of white sugar, 1/2 cup of brown sugar, 1 stick of butter, 1-1/2 tsp of vanilla and 1-1/2 tsp of cinnamon I used the crumble for the top of the peaches. Don’t add a lot of juice because it will bubble over. This is delicious! The filling is so nice. We prefer the topping with old fashioned oats, 1 tsp. cinnamon added, and no leavening agents. Many thanks! Will home canned honey crisp apples work in this recipe? I like to bring dessert when asked over for dinner. Because I love a real crispy crumbly topping, I add 1 egg to the topping. This is a delicious dessert to bring to dinner! Thanks for the tip!